ab176261 is predicted to not cross-react with other WDR family members. Synthetic peptide within Human WDR18 (C terminal). The exact sequence is proprietary. Peptide corresponds to 17 amino acids near the carboxy terminus (NP_077005). Rat lung tissue lysate; Human lung tissue. Our Abpromise guarantee covers the use of ab176261 in the following tested applications. 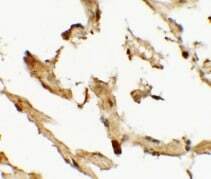 IHC-P Use a concentration of 2.5 µg/ml. Perform heat mediated antigen retrieval with citrate buffer pH 6 before commencing with IHC staining protocol. WB Use a concentration of 0.5 - 1 µg/ml. Predicted molecular weight: 47 kDa. Immunohistochemical analysis of paraffin-embedded Human lung tissue, labeling WDR18 using ab176261 at 2.5 μg/mL. ab176261 has not yet been referenced specifically in any publications. Publishing research using ab176261? Please let us know so that we can cite the reference in this datasheet. There are currently no Customer reviews or Questions for ab176261.